Sounds like enough people are playing The Division on PC and PS4 to create a list here. The game releases on March 8 for XBone, PS4 and PC. Post up with your details and i'll add you to the OP. Add your friends on your platform if you're not linked yet. Spainman: (Spainman1225) Preorder Status: ???GOLD??? H33TZONE and Snowy like this. Congrats Snowy! Preordered and rdy to go! Is it worth getting the Gold Edition? I haven't campaigned for a game so hard since WarZ's flop, and we all know how much traffic that brough in for a short while. Nowhere near that turnout but I'm campaigning every day. I think I gave out 30-40 beta keys over the last month that I may or may not of not acquired from someone on the inside. I have set up a small crew for this game, I will just list their names here. And possibly 5 others, can't confirm if they have preorders in yet. When you pre-order, do they take your money right then or are they going to wait until the release date? And if you have any more keys left, Martinfort, I'd like one. My Uplay name is RealRhyus. I am currently taking point for the team I have assembled. Let's take a look at how everything is looking closer to the end of the month and we will see if I am the proper fit for those that will be playing as far as trying to setup rally times and Dark zone events. The Dark Zone is going to be the primary focus for group play on a massive scale, trying to access the same Dark Zone server, shutting it down and manhandling all the extractions. So as for a Tl;DR version, I would be interested, but lets see how it goes up to launch, If the Open beta does in fact happen in a couple weeks, we should ( I ) will try to get everyone together and work out some Dark Zone stuff. Easiest way to get ahold of me is to message me on here, I do run an ARK survival evolved server currently and operate a teamspeak for it, so I'm usually in there. ts3.martinservers.com . Adding you to Uplay, as for right now there's no announcements on Closed Beta op 2 for PC. but there are supposed leaks of an Open beta coming up. If i hear anything more about it I will let you know via PM or quote here. I see that Martinfort is going all out, i like it. I might or might not steal some of your ideas, if you allow. As far as AoA on ps4, i'll keep you posted on any new additions. I believe i have at least 3 or 4 people who are not on this list and are not AoA yet, but i have played with on the Closed Beta. You can take whatever ideas you find or create from my postings, maybe we can chat a bit about how to approach The Division as a group to come up with the best methods to strike in the DZ. I agree. Our crew has played the beta, and we really liked the DZ. There were some locations and ideas on how to make quick points to get the HIGH-END items. I'm not sure how it will apply in the real game, but i believe we are comfortable with the setup. As i said, I'll try to keep posted, and we should definitely have a chat about other ideas regarding everything. My understanding of the last two beta phases, NPC's are cut down hard, maybe 50% volume? So keep that in mind, there SHOULD be more NPC interference and static in the DZ and PvE sectors. Ubisoft doing this force players into the DZ, and into PvP, this was a great move on their part if it's true. Do you have to pay for the pre-order when you place the order or when it goes live? But for this, I have to go into one of their stores to purchase it? Does anyone know anything about an Open Beta, or when i can find such info? I'm sure some people would like to get a little more taste/practice for the game. 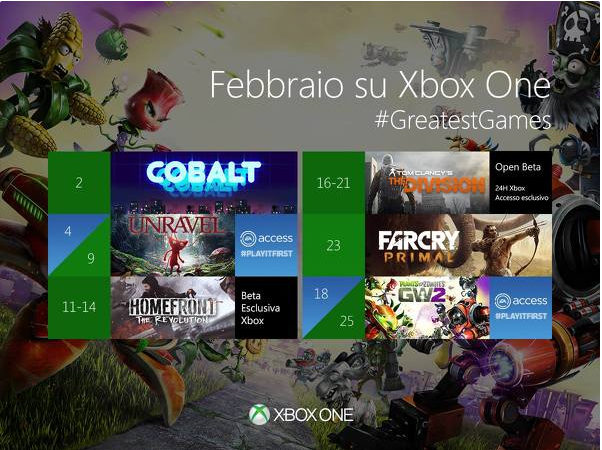 According to Eurogamer, the Facebook page of Xbox Italy has inadvertently revealed that the game is indeed doing another "Open Beta" from February 16 to 21, as shown in the site's calendar of activities that Xbox Live members can look forward to.